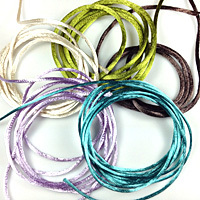 Matter (less shiny) in appearance than the rayon satin cords and the 1mm and 2mm nylon cords, this cord is woven with multiple thin cords. 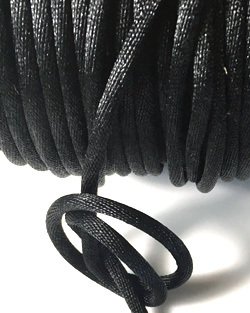 The outer cords are black and made of nylon, the inner cords are whiteand made out of synthetic fibers - they melt at higher temperatures than the outer fibers They are probably made of polyester fibers. The inner core is woven with the uter core and cannot be separated. 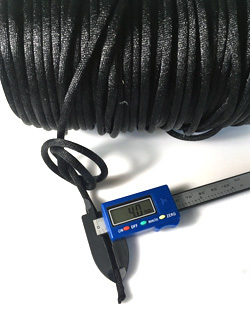 This cord is dense and fairly stiff. 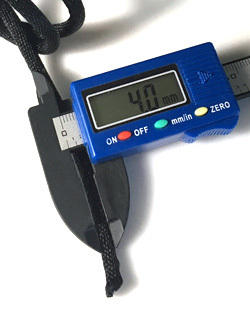 It is recommended as center core for braids, kumihimo, and tubular beaded crochet for bracelets and short necklace, or longer cords with heavy pendants. Personal Note - This is a new product. I have to experiment with it. I will let you know how it goes! Made in China. ~ 4 mm Ø. can be squeezed to 3.8 mm.